Aloe vera is a succulent plant with long, thick, waxy leaves containing inner gel and outer gel, along with latex liquid from the inner leaf skin. People use aloe vera gel and juice for topical and oral health remedies. 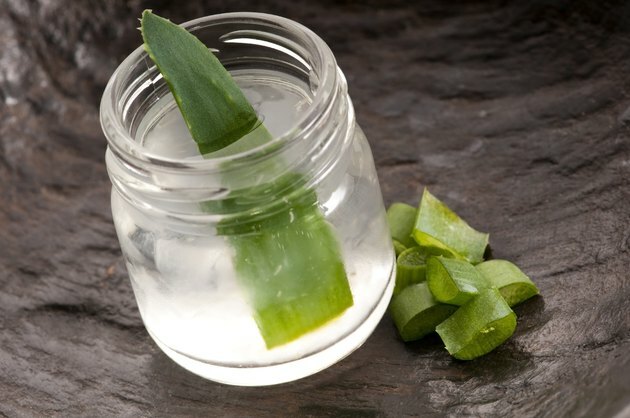 You can grow aloe as a houseplant and make juice by breaking off leaves and scooping out the gel, then juicing this gel in a blender. Aloe vera juice also is available commercially. Side effects are uncommon. The inner leaf of aloe vera has laxative effects, according to MedlinePlus. Consuming large amounts of whole leaf aloe vera juice rather than juice made from the gel alone can cause painful abdominal cramping, loose stools and diarrhea. Using this type of juice longer than a week can lead to laxative dependency and constipation after you stop drinking the juice. People experiencing this type of diarrhea may develop dehydration and electrolyte imbalances, including low potassium levels, especially if they are diabetic or have kidney disease. Low potassium levels can lead to muscle weakness and irregular heart rhythms. The laxative effects of whole-leaf aloe vera juice also can decrease the absorption of many drugs. Consuming aloe products including the latex for over one year may increase the risk of colon cancer, notes MedlinePlus. Drinking aloe vera juice may reduce blood glucose levels. MedlinePlus advises people prone to hypoglycemia and those taking medications such as metformin or insulin to regulate blood sugar to be cautious about consuming aloe vera juice. Although aloe is used topically to heal certain skin disorders, it also may cause skin irritation. Surgical wounds have healed more slowly after application of aloe, according to MedlinePlus. Additionally, applying aloe juice to the face after a skin peel (dermabrasion) may cause redness and burning. Applying aloe vera juice to the skin before sun exposure can cause a rash. Some people are allergic to aloe. This allergy is especially common in people who are allergic to plants in the Liliaceae family such as garlic, onions, hyacinths, lilies and tulips. Signs of an allergic reaction may include skin rash or hives, itchy or swollen skin, difficulty breathing, tightness in the throat or chest and chest pain. An allergic reaction to aloe vera juice should be considered a medical emergency.